The metal-winged RAID Dodge is currently the hottest bait in Japan. Taking lure designs to their natural conclusion is a desire many Japanese companies strive for, but some surpass that and venture into the absurd. 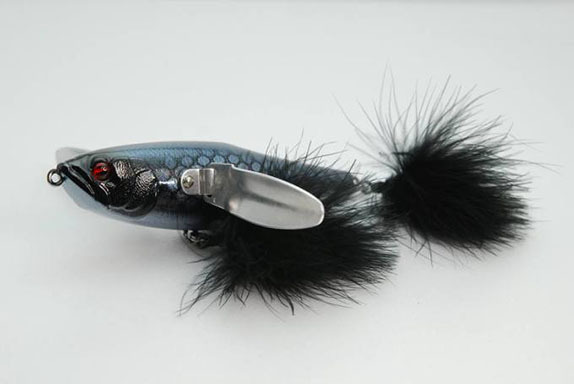 The giant crawler topwater, the hottest bait in Japan for the last 3 years, is just such a bait that might look too weird to use. Sporting long metal wings, two marabou-fletched treble hooks and a candy-coat paint job, the RAID Dodge looks too funky to fish. Yet this large topwater is a favourite across Japan. The RAID Dodge, a 114-millimenter (4 3/4-inch), 1-ounce crawler, is the must-have bait of Japan. Some tackle stores have resorted to raffling off baits when they�re lucky enough to get a shipment. Dozens of companies have jumped on the tidal wave of popularity of the crawler, making their own insect or minnow version of this classic dual-winged bait. Anglers have a wide selection of these baits choose from � tiny 1/4-ounce bug baits to magnum baits over 2 ounces � but the 4 3/4-inch version seems to be the most productive. 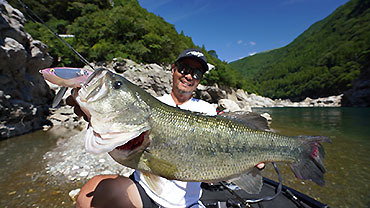 It has accounted for trophy bass throughout Japan, which has to the hype. A quick scroll through Instagram (#raidjapan, #raidjapan_oka, #lakebiwa, #okuda_manabu) will confirm any doubts of how many giant bass have fallen to it. The president of RAID Japan, Takashi Kanamori is a famous professional angler who is best known for his sight-fishing and crawler-bait skills. In 2008, he used them to perfection in a Major League Fishing (MLF)-style bank-fishing event put on by Lure Magazine, which helped put the crawler-style bait on the map. In 2011, Kanamori started RAID Japan and the Dodge was born shortly after. Month by month in 2018, more crawler versions are being made to fill the shortfall of baits. Options are limited for purchasing a magnum-sized crawler in the U.S., but the widely available Jackall Pompadour is a great choice. At 3 inches and just under an ounce in weight, it has great action and will be an easier mouthful for American bass. Takashi Kanamori, president of RAID Japan, shows off the effectiveness of his RAID Dodge. Big swimbaits are nothing new to U.S. anglers, but their versatility is often downplayed. The �big bait� enthusiasts are a distinct sub-group of bass anglers in Japan and across the world who are obsessed with catching monster bass on magnum baits. These trophy hunters have inspired leagues of anglers to launch muskie-sized soft and hard lures. If you�re into throwing these things but itching for something different, keep an eye out for Deps, Elements, Fish Arrow, or Signal. Each company is creating and designing truly unique lures that no American bass has ever seen. Not all big baits need to be extreme � the summer of 2018 saw the rise of large square-bill crankbaits. Cranking square-bills, particularly the Lucky Craft SKT Magnum, accounted for many �Rokumaru,� which translates to 6 and 0, or 60 centimeters (23.6 inches), which also means over 7 pounds. Again, the Japanese guides and anglers are always looking for an edge and are willing to experiment to get it. One trend that is only now getting traction in America is the desire to personalize fishing gear, particularly reels. Japanese anglers have tricked out their spinning and baitcasting reels for years. Reels can be customized for aesthetics and/or improved performance. 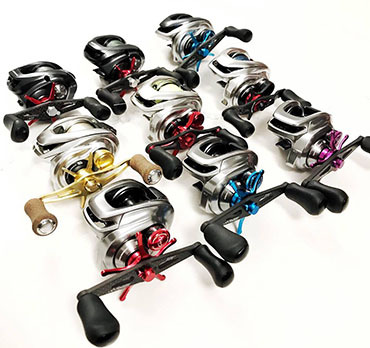 Japanese anglers love their casting gear, but often need to use light line for more bites, so they revamp their casting reels to handle lines as light as 6-pound test and feather-light baits. These demands pushed after-market companies to produce the lightest and smoothest reel parts possible. Upsizing reel handles and swapping out star drags is just the start to personalizing baitcasting reels. Many Americans are familiar with replacing bearings, but not to the same scale as it is done in Japan. Swapping out stock bearings with ceramic performance models will transform a mid-range reel to a high-performance one, and a high-end reel into a dream. Expect silky-smooth spool operation resulting in casting ease and greater distance. The most fanatical "gear heads" replace reel-handle bearings for the smoothest performance. Replacing spools for skeletonized versions is one of the most stylized, yet basic upgrades. Accent-colored knobs, handles and star drags add to a personal fishing machine. Over the years, reel companies have flirted with giving anglers something different, but were met with limited success. Currently, Abu Garcia, Lew�s, and 13 Fishing offer reel colors other than the traditional black or silver. If rebuild a reel isn�t your thing, don�t fret; better performance can be a squirt away. At this year�s ICAST, several Japanese companies were touting synthetic reel oil. ZPI, one of Japan�s largest reel accessory companies, partnered with Lucky Craft USA to promote the F-Zero high-performance bearing oil. A few dabs sent the display reel into a blur once in free-spool mode. Having Aaron Martens and Dustin Connell on its pro staff confirms that ZPI is committed to marketing its products in America. �The Japanese bass-fishing scene has matured over the last few years,� said Gan Craft executive sales manager Kotaro Kake. Most of the biggest companies have established product lines and a strong following in Japan and even in America, so they are content. Small refinements are always being made, but Kake expects the next bass-fishing trends to come from smaller lure-makers looking for an edge over the mainstream companies.